This year I was invited to speak at Codemash, a huge, multi-disciplinary event for software engineers, project managers, web developers, and others in the industry. 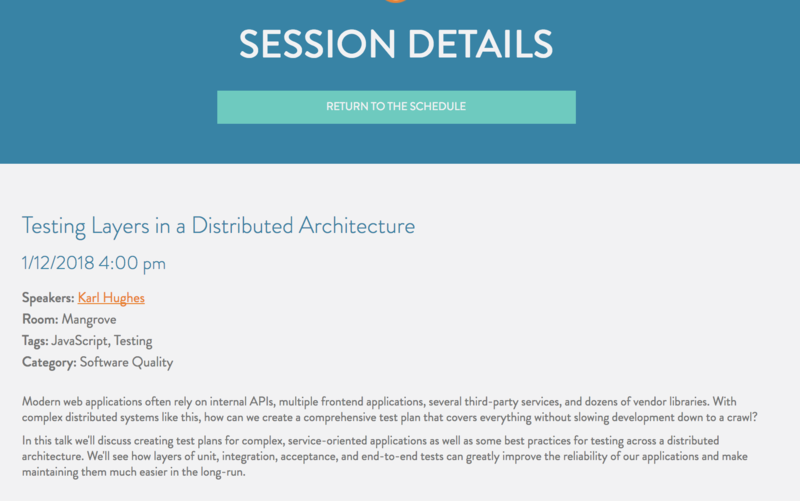 I gave my talk on Testing Layers in Distributed Architectures, but unlike the 25-minute version I gave at AP Strat & Practice, this version was a full hour long. While the weather deteriorated on Friday (and my session was in the last time slot), I had a large, highly participatory audience who gave me some great feedback during the session. I didn’t get to screencap or record this session (my own fault, I just forgot to turn on Quicktime), but the slides are available on Google Drive. I’m really glad that so many people in software development are interested in testing, and I can’t wait to give the talk again at U of I’s Webcon in April.